Our gas generators are of optimum quality, durable and easy to handle. Our on site PSA nitrogen generators are custom made and can be adjusted to give the desired nitrogen quality for your process and application. This model is the simplest to produce nitrogen of a purity in range from 95% to 99% purity. However, if carbon molecular sieves quantity is increased, even 99.999% purity nitrogen can be produced from this model. But running cost would be higher in case of higher purity. Thus, this model is recommended for purity up to 99.9% only. This model is generally used to purging or Inertizing applications. This model is commonly used in metallurgical industries for providing oxygen free nitrogen for heat treatment furnaces. Here, the oxygen is less than 1-ppm and but hydrogen is around 0.5 to 1% which is desirable as reducing constituent in most of heat treatment applications. “MS” models can also be converted into “DX” model by adding palladium deoxo reactor and Gas Drying Unit. “DX” model is also applicable in chemical as well electronic industries. “Copper” DX Model contains an extra nitrogen purification module based on copper deoxo catalyst. This model finds application in synthetic fiber, optical cables & electronic industries. Running cost of this unit is slightly higher because it produces very pure nitrogen gas i.e free from oxygen and hydrogen as well. It is applicable where hydrogen contents are detrimental to the process. 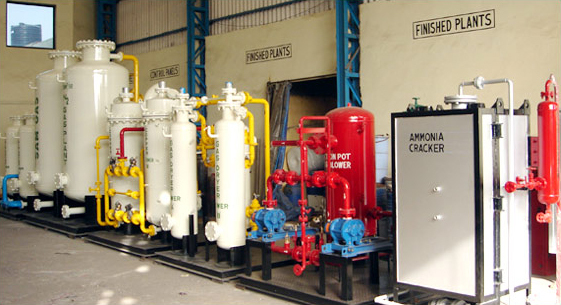 As Inert gas In Chemical Industries, Food & Pharmaceutical Industries, for fire control in Coal mines etc As Inert gas in Chemical, Food Pharmaceutical Industries, Heat Treatment Furnaces, Electronic, Synthetic Fiber, Industries. As Inert gas in Chemical & Pharmaceutical Industries. In applications where oxygen impurity is not acceptable. 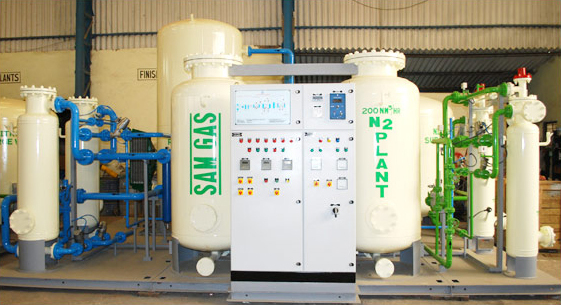 As Inert gas in Electronic, Synthetic Fiber, Hitech Industries where one needs Ultra High Purity. Very high reliability to run un-attended for months & months. Carbon Molecular Sieves life is 15-years and in most cases it lasts the whole life time of Gas Generator. 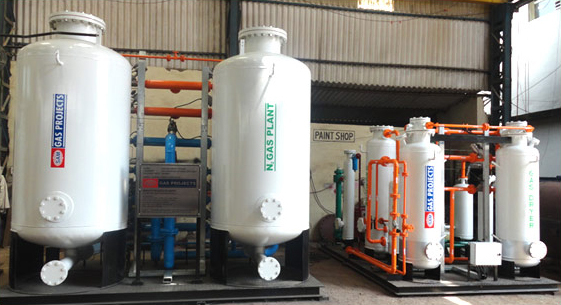 Such kind of Nitrogen Plant With Booster is provided, if the requirement at the discharge is at higher pressure. Normally our PSA system can provide pressure at discharge to about 6 kg/cm2 g. but it can be increase up to higher pressure of 10-150 kg/cm2 g based on client's requirement. for this we need additional booster,suction pot and finned cooler after the surge vessel so as to enhanced the pressure up to higher pressure before storage tank. Rest of the principle is same as ms model.